The Unnaturalness of Natural Man | "Northern Crossings"
We received this cat sculpture as a gift years ago and I have to admit that coming around the corner of the yard it would startle me because it looked in a quick glance like the real thing. As time and the weather have worked on it, it is not quite as lifelike, at least not in the full sunlight. Two things here – one is that instinct that people have to make reproductions out of living things that they would probably try and exterminate if they had the living thing around them. East Grand Forks has sculptures of wolves and elk around the town. Every few years we hear how folks would like to get rid of the wolves, especially the hunters and the folks with cattle, and if memory serves, there was a standing heard of elk that use to exist around Grygla Minnesota that was hounded out of existence. If I am wrong about that I know there was a free standing herd around Goodrich North Dakota that was run out and run down and finally disappeared. I wonder if they have concrete elk statues in Grygla or Goodrich. I hear from a lot of folks that want to move out in the country to be close to nature and the first thing they do is get rid of the nature that is out there in the nature in the first place. The skunks have to go and so do the raccoons and the woodchucks. Coyotes make too much noise and foxes mess with the dogs and cats, especially the cats, unless they are concrete. This is not a blog about taste so much as it is about how perverse things can be. The reproduction of the natural by folks who don’t seem to like nature too much is one thing but the other is the flower. 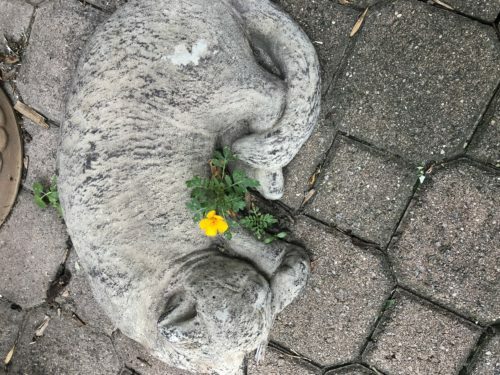 The flower is seemingly being protected by the concrete cat. Pretty cool image and there might be some poetry in there somewhere, but here is my problem – I didn’t plant the flower. I can’t remember what the flower is but it is not a dandelion and I didn’t plant it. In fact we have some of these that we planted and had all kinds of trouble getting them to grow. This just came up kind of natural like. So we try and care for something and it dies but grows wild next to a fake cat. I used to joke with the farmers and tell them that they should plant wild oats and the wheat would grow. I look for the sculptures of bears and wolves and other critters in the yards of folks that wouldn’t be caught dead in “real” nature, unless they were, well, dead. So there is a perversity here that is interesting at least to me. It must have something left over from the fall in Genesis 3. Cursed is the ground because of us and the flower we tried to cultivate in a special place grows wild between the cracks in the flag stones, exactly where we don’t want plants. Folks who would never have a cat around plant a cement one in the back yard to give the feel of the peace of a feline sleeping because it feels protected even though they would chase it from their backyard so fast it’s feline head would spin. Man by nature – pretty unnatural. Conventions, Prayers, and Shawls and Scarves and Mercy. Dead Histories and Histories of the Dead.